Kind time of the day, dear artists and fans of cool cars! 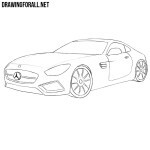 Today we present to your attention a new drawing lesson about how to draw a Mercedes Electric SLS. We draw our Mercedes SLS from the half-turn view. 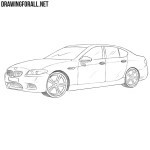 Grab a pencil and sketch out the main contours of our car. 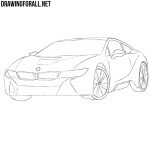 In the front part we outline the contours of the grille and the headlights. Then sketch out mirrors and wheels. Now we will start working with clear lines. Draw out the grille and the contours of the characteristic headlights. Draw a line of the hood. Under the radiator grille we draw the bumper, air intakes and fog lights. Let’s move to the top of our Mercedes SLS and draw the roof, windows and the rear-view mirror. Now let’s move a little lower and draw the legendary gull doors and details on the side of the car. Using clear lines draw the wheel arches and the wheels themselves. This is a difficult step, but we are sure that you will cope with it. And in the last step of the drawing lesson about how to draw a Mercedes Electric SLS we draw rims. Also you can add a few shadows as for example in the lessons about the Ferrari or Ford Mustang. 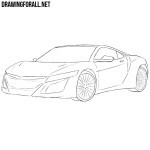 In our drawing lesson we showed you how to draw a Mercedes Electric SLS. 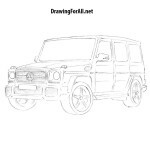 If this lesson was useful you then visit the drawing lessons about Mercedes G and Mercedes AMG GT. So subscribe to us in social networks and share our drawing lessons.